24 Very early in the morning on the first day of the week, the women went to the tomb, bringing the fragrant spices they had prepared. 2 They found the stone rolled away from the tomb, 3 but when they went in, they didn’t find the body of the Lord Jesus. 4 They didn’t know what to make of this. Suddenly, two men were standing beside them in gleaming bright clothing. 5 The women were frightened and bowed their faces toward the ground, but the men said to them, “Why do you look for the living among the dead? 6 He isn’t here, but has been raised. Remember what he told you while he was still in Galilee, 7 that the Human One[a] must be handed over to sinners, be crucified, and on the third day rise again.” 8 Then they remembered his words. 9 When they returned from the tomb, they reported all these things to the eleven and all the others. 10 It was Mary Magdalene, Joanna, Mary the mother of James, and the other women with them who told these things to the apostles. 11 Their words struck the apostles as nonsense, and they didn’t believe the women. 12 But Peter ran to the tomb. When he bent over to look inside, he saw only the linen cloth. Then he returned home, wondering what had happened. I don’t mean resurrection is not real – or even that resurrection did not happen – no, the resurrection is real, it happened, but it is nonsense. Non-sense, non-sensical, non-sensible – resurrection does not make sense. As Atinuke Diver had said of other people reading our essays: “It can flatten you.” Suddenly, we may only exist in someone’s mind as the five pages we filled in a book. 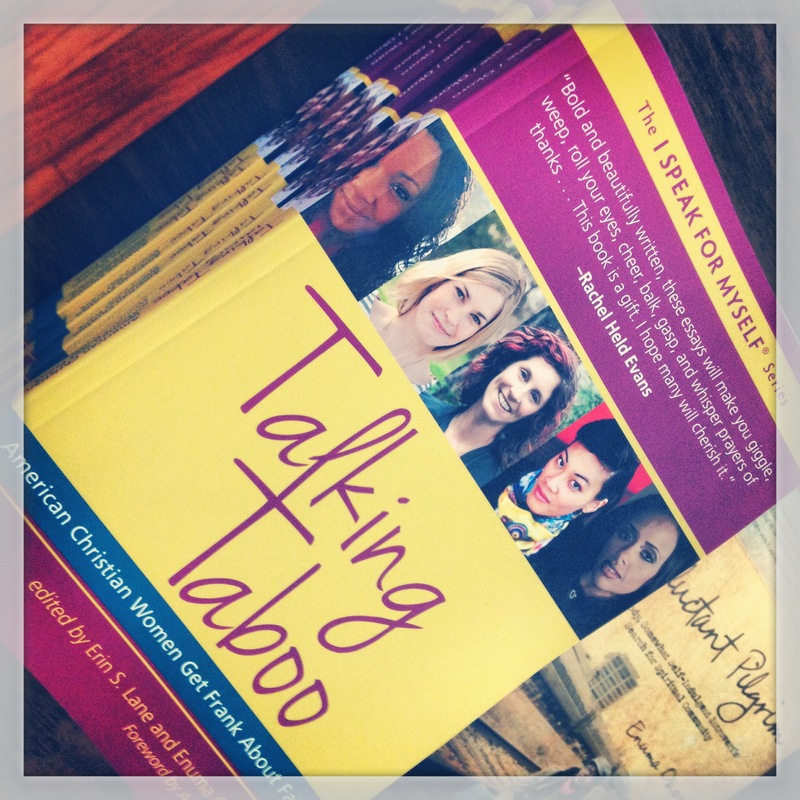 Meeting more of the contributors to Talking Taboo was, as i expected, a delight and a dialogue. At last night’s event, i was grateful for the solidarity of each of us speaking for ourselves gave way to an authentic, vulnerable conversation. It was refreshing and reaffirming, the reminder that all 40 of us had snapped wide our secrets made it easier to continue to speak against silence. And i’ve not stopped chewing on what Tinu and Bristol said. There were so many insights, and since the whole point i want to make is reducing someone to one essay or one quip is dangerous, i’m already having trepidations. These are two brilliant womyn who each contain multitudes, as we all do. So i don’t want to wrangle down or warp what they said. But it’s this idea of flattening, this confining the words your read by someone to being all of who they are that has sat the most with me in the remnants of our conversation. I think about my favorite authors who are currently living: J.K. Rowling, John Green, Toni Morrison, Alice Walker. John Green especially has led a rather public career with his (excellent!) video blogs, but even he has on occasion had to remind the nerdfighter community that he’s a whole person, someone who has struggled with Depression and social anxiety as much as he is a New York Times Best-Selling author. Someone who has two kids to raise and most days is trying to be a dad and a husband with a kind of banality we forget about when all we see is a clipped-together four minute hoot on trademarks. The first month i lived Edinburgh, everywhere i went i carried a small, paperback copy of Harry Potter and the Philosopher’s Stone. I frequented the Elephant House reading it so much i felt myself oozing cliché. (The Elephant House Café, for those who don’t know, is where J.K. Rowling penned much of the first three Harry Potter books). I tucked it in the middle pocket of my backpack for one main purpose: were i to run into Jo Rowling, to have something for her to sign. But the more i thought about it, the less i carried the book around. I imagined running into her while she was out with her own children – imagined how clumsy and imposing i would be, asking for an autograph from a mum having normal old mum-time with her kids. I recalled times when i was out with my own mother, having normal mother-time, and members of her congregation interrupted our lunch to talk about their church-y needs. How as her daughter, i tried to be understanding of her position as counselor and confident to these people, but couldn’t help the irked sense that these congregants didn’t fully respect that my mom was a whole person whose whole life did not revolve around her church. I think we do this all the time in our lives, in so many ways – we box people in. By race, gender, sexuality, class – but also by how we have conceived of them in our minds. Teachers don’t live in their classrooms, pastors have vices too, authors are more than their words. I am so grateful for every message, email, and dining hall happenstance when someone says they’ve read my essay and it meant something to them. I’ve not learned how to stop turning a delicate shade of tomato, nor how to properly communicate how flattered and humbled and thank-you-for-holding-my-heart-so-gently i feel with every one of these encounters. More than once these encounters have made me weep. Bristol is right, a lot of life has happened between when pen was first to put to paper and publication. My essay rings to me now of too many run-on sentences, of how early in my now engagement i was writing about intimacy and the toughness of love. But what has not changed is the nakedness i felt writing it – the nakedness i feel when people say they’ve read the book. So please, don’t get me wrong: thank you for reading, thank you for your kindness, for your affirmation, for your talk back and pushing and pulling and questions and comments. I guess what i want to say is thank you, thank you, thank you, but know there’s more. Not “just“ more to the body-image, sexuality, relationship journey, and not “just” more that i will never want to write or talk about publicly because even intercom-level-lizzie can be private. But more in the sense that some days i am a very boring, very not-creative, very not-roaring-feminist lion lizzie. I like eating cookie dough and really prefer days spent watching zombie movies in my pajamas with my brothers to any other activity and i know, acutely, that i talk about myself too much and i definitely over-analyze how much or how little this blog/my essay means to other people (i mean, really, i may wish i was Alice Walker, but let’s be real). Even now, i’m biting my nails and thinking will the twelve people reading this think i’m some ungrateful whiney snob with poor taste in adverbs? So maybe this post is an over-analyzing, over-thinking mess and i should just pop in World War Z and pull out the tube of Pillsbury’s. John Green, after all, says over and over we as humyns must learn to imagine complexly, realize that the truth resists simplicity and that there is always more nuance than we want and more questions to ask than answers to find. I’m trying to find that balance of imagining others complexly as i ask others to do the same. The Season of Weeding: Abim & Kotido, Summer 2011. 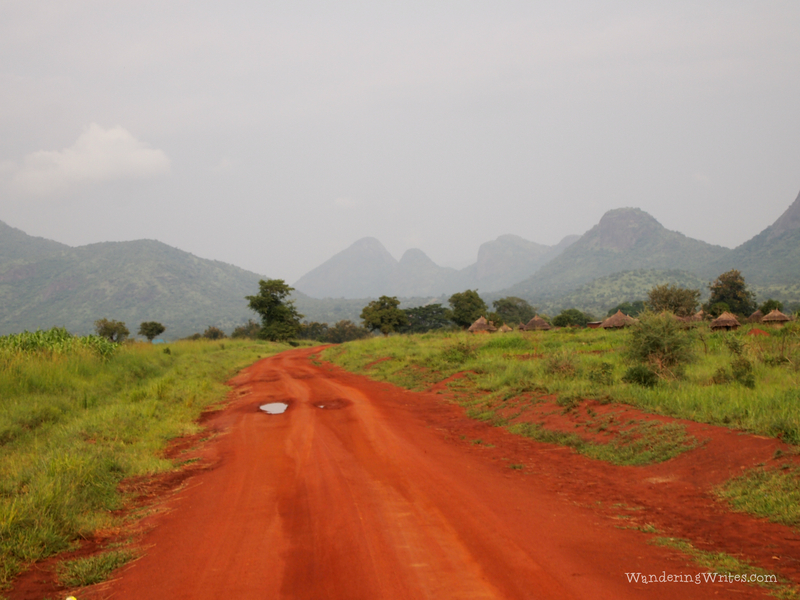 It was a two-day journey from Kampala to Kotido, only half of the way on paved roads. We did it in one day once (well, i did it once, my housemates lived there for three years and i, only three months). And the one time we did in one day was hell – my stomach had shrunk to the size of a walnut with its inability to keep anything down for three weeks, i was dehydrated, and i’m pretty sure i hallucinated. But when we made the trek over two days, it was a dream. 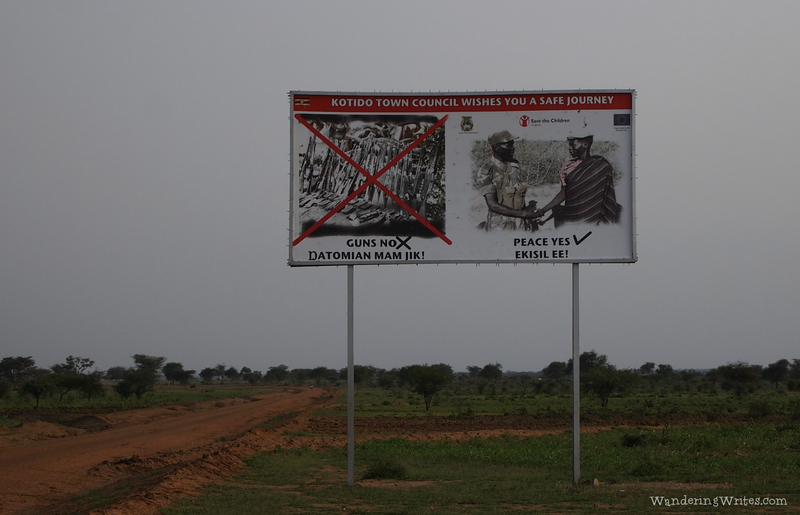 To get to Kotido, we had to pass through the Abim region. Abim is like nowhere else i’ve ever been. 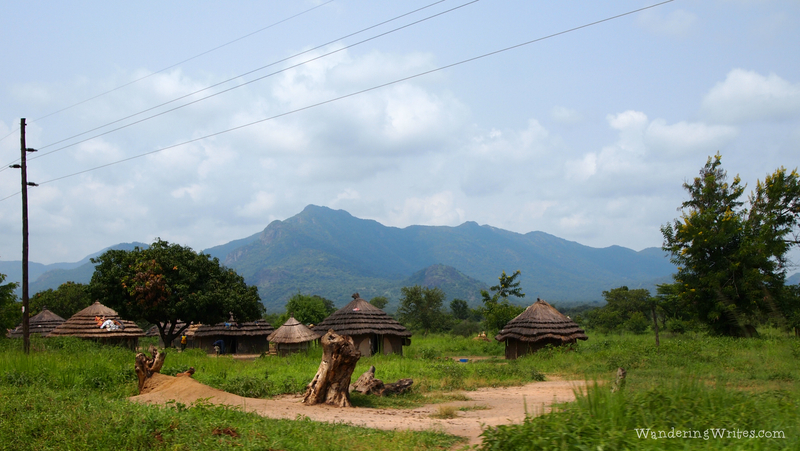 Even at the time, i think i wrote more blog posts about how voracious the colors were of the Abim mountains than i did about Kotido, which i did in fact quite love. 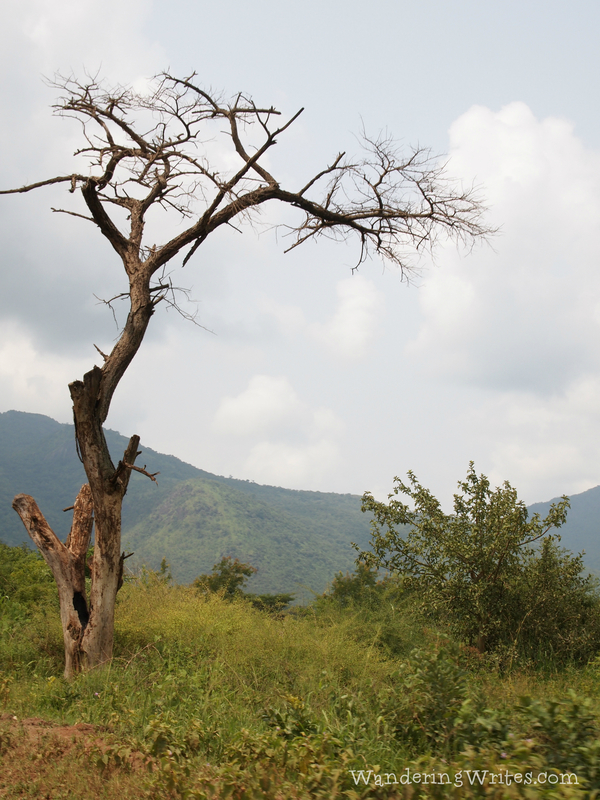 You could see where the powerline stopped, somewhere in a town in the Abim region but long before we were in Kotido. Our home has a solar panel and small amounts of voltage so long as the sun was out. We’d take turns charging our laptops, running a mini-fridge a few hours a day to keep home-made ricotta cool. It was the rainy season, nothing like the dust-curling bone-heat they told me of when it was the dry season. I remember being grateful for the one sweater i’d thought to slide into my suitcase. In the Kotido market, during a rainstorm. My “room” in the house was a mattress and mosquito net tucked in a corner, shrouded by a collection of curtain pieces like the ones in the above photo. It was Thera‘s (very thoughtful!) idea, to give a fellow introvert some more privacy. She’d even saved me some ticky tack, to hang a collection of photos and postcards on my wall. I was re-living this summer while Jonathan (supposedly) studied for his Greek exam. “It’s kind of crazy to me that you did that,” he commented, the photo Thera snapped of me on a boda-boda on my screen. He didn’t mean crazy as in foolish, or as in out of character. This was a hint of green in his voice. More like it was a reality unknown to him, a part of me before us. And yet it was because of Uganda the “us” even happened. We’d had a champion of awkward first dates, us alone in an Applebee’s save the one guy hellbent on making Karoke night a thing. I’d just buzzed my hair, prepped for a summer of sub-Saharan heat and lack of hot showers. I noticed his dimples, the eyes, even then. But i my focus was on the 7,414 miles to conquer and courage to find. Thank God for my mom. A friend of ours had prepped and de-briefed with both of us, a woman who had spent the bulk of her adult like working for MCC on the continent of Africa. “You’ll need spaces to really talk, to really be heard,” she’d told us. Mom arranged for me to preach my first Sunday stateside again, at her then-new church. She let me lowercase the bulletin and screen a video i’d edited of my time abroad. It was Jonathan’s first Sunday as the worship music leader. He was one of the first to really listen, to let me be really heard. I remember noticing the eyes again in worship planning, how he didn’t judge me for wanting to juxtapose John 15 with an E.E. Cummings poem. The fact that it’s me in that picture feels unfathomable. Not that i had the desire to learn and see and listen in Uganda, i still have that desire. But that time in my life, the depth and wonder and complicatedness of where i was feels far, far in my past and far from here. I know it happened, for how could a summer of confronting my own white, American privilege not leave contours on my perspective today? Maybe it’s the coming-full-circle thing, that bite and blister and beauty of seeing the time and the growth and the redaction between lizzie on that motorcycle and lizzie getting married. I have no regrets, the loves of my life all intertwining in the most bizarre of stories. I was so young, so eighteen, so fresh out of my first year of college and so wanting to know more than i did. I said then it was a summer of pruning, like the name i had been given: Nachap, the season of weeding. The seed that has grown the most, though, is the realization that every season is one of both pruning and growth. Sometimes the balance tips, hands deep in the earth straining with the baobab roots to come up. And sometimes it’s the blossoms, blossoms who need water and sun like all seasons but whose focus is so on being alive there’s little room for weeding. And sometimes, i think you just have to slap on the gardening gloves and make a choice to keep planting, whatever the weather. in case you missed it, some of my favorite posts from my summer in east africa: south sudan’s independence day; when we went all the way to kampala so we could see the last harry potter movie; on our access to water in kotido. My phone has been pinging with the most precious selfies a lady could ask for: friends with grins as big as Texas holding up their copies of Talking Taboo! People aren’t just snapping sassy selfies; i’ve been to one fantastic event already – the Homegrown Preaching Festival in Durham, NC, sponsored by (my favorite non-profit) the Resource Center for Women & Ministry in the South. We had a phenomenal conversation about shame, preaching tough texts, and writing in our multitude of authenticities. The best part for me, though, was that my mom finally got to read my essay. With the woman who inspired my essay! I say “finally,” like some centrifugal force was withholding information from her. Really, it was knee-knocking me. But an hour or so before the event, i figure the caving needed to happen and she best know what she was getting into. Spoiler: my mother is the direct inspiration for my essay, as she is my inspiration in my every day. Talk about one helluva boss lady. Needless to say, my knee-knocking was a moot point. There were tears. Sloppy, mommy-and-me tears. So it’s going to be hard to top event #1. But i have a pretty solid feeling that the next two big events i’m participating in are going to be hefty competition. And you’re invited to both events! The first is the official book launch party on Saturday, November 2nd from 5 – 7 PM at the Reality Center in Durham, NC. It’s free, open to the public, and there’s going to be cocktails AND readings from some of the contributors. And, of course, there will be books available for purchase. Seriously, what more incentive do you need? The second is still in the works, but folks in the Pioneer Valley, MA, should mark their calendars for December 3rd for what promises to be an excellent conversation and reading at All Saint’s Episcopal Church in South Hadley. Details to follow! These aren’t the only events connected to the launch of the book – be sure to keep tabs on the event page of the official website for more readings and conversations! I hope, for those of y’all in the NC area, to see you at the official launch party! best thing: cabin trip tonight! current jam: ‘marry you’ by jason derulo. typical.